Twenty years ago tomorrow, I learned of the death of Kurt Cobain. I’m ashamed to say I don’t remember how I learned about it exactly, whether it was a news flash on broadcast TV, or MTV’s day-long elegy, or songs played in tribute on the radio. But I remember how I felt. I remember being home during spring break of my junior year at college and parking myself in front of the TV in disbelief, and grief, and anger. I remember my parents recognizing that this was A BIG DEAL, and I should not be disturbed or roused from my pathos. Maybe they recognized how they felt when John Lennon died in 1980, an event equally traumatic for our baby boomer parents and teachers (my elementary school had an assembly in the cafeteria with the news projected on a big screen while staff cried, and we students knew something bad had happened but didn’t grasp exactly what). I first learned about Nirvana when I went to my high school’s homecoming game in the fall of my freshman year. A friend who was always the first to find new musical talent was talking about “Smells Like Teen Spirit.” I took her endorsement seriously and bought Nevermind within a couple of weeks of its release. It didn’t disappoint. So much has been written about that first single, the landmark album, and the band’s influence on music and pop culture that I won’t even attempt to address that here. 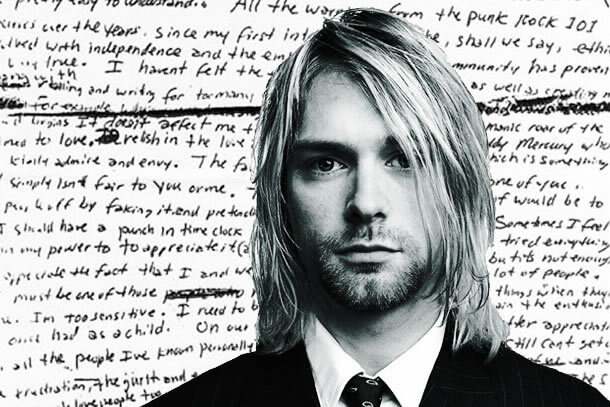 Google “Cobain Music Legacy” and you’ll get scores of great articles on that aspect. This is about a very different legacy that was created when Cobain decided to stick a shotgun in his mouth and end his life on April 5, 1994. When he chose to leave his kid, his wife, his band, his fans; when he decided to “burn out” rather than “fade away,” to quote the suicide note Courtney Love read/screamed through tears at his April 10th memorial in Seattle. But let me back up a bit, back to 1990. While Kurt and Krist and Dave and Butch were putting the finishing touches on Nevermind, I was in the first semester of my senior year of high school. I was also experiencing my first major depressive episode. The stress of the college application process and other typical high school struggles combined with my existing not-quite-right neurochemistry to send me spiraling downward into a six-month long trudge through darkness and despair. It wasn’t all bad: there were moments of joy and victories small and large, friendships new and renewed. I lost 25 lbs when my appetite vanished. My bedroom was impeccable from a depression-fueled cleaning compulsion. I got into the college I was meant to attend, a place that will always feel like home to me. But throughout all of this was an undercurrent of psychic pain that I would not wish on my worst enemy. If you want details about what it was like, check out Hyperbole and a Half. Allie Brosh describes it better than I ever could. I’m sure Cobain was feeling that same kind of pain as 1990 turned to 1991, and time moved forward. After his death, the media focused on him and his music, and they focused on heroin. 1994 was not all that far from the Nancy Reagan “just say no” years, and the major networks latched onto Cobain’s death as a cautionary tale, a way to warn parents and scare teens. Obviously, addiction played a role, but that missed the point. The addiction was a symptom not a cause, and in 1994 no one wanted to discuss mental illness. Prozac was just coming into its own and admitting you saw a shrink was really acceptable only in Manhattan and LA. For most people, mental illness still felt a lot like old time demonic possession, some perversion of the self brought about by a moral failing. And while “having the blues” was somewhat acceptable, the diagnosis that Cobain and I share, Bipolar I Disorder, most certainly was not. Better to be a junkie than crazy. As with Cobain, my depression continued as my teenage years turned into my 20s. And, as I imagine was the case with Cobain, bouts of mania also surfaced: brief respites from the darkness fueled by amazing energy, focus, purpose, and feelings of invulnerability. Heady stuff, indeed, that, in contrast, made the dark times that much worse. Recitation of this sardonic take on suicide worked most of the time. When it didn’t, I fell back on my Catholic upbringing: suicide being the only truly unforgivable sin. Unfortunately, as I became an agnostic this held little sway. More powerful was my own sense of altruism. I didn’t want my young and healthy organs to go to waste but also believed strongly in gun control. It was a practical conundrum that got my brain whirling on something other than how much pain I was in. That generally worked well. And in the years after Cobain’s suicide, his taking of his own life served as a final defense for me. Dumb as it sounds, it gave me a glimpse into the repercussions of self-annihilation. Sure, the suicide is no longer in pain, but what about those left behind? I had always known intellectually that if I took my own life that it would be devastating for my parents and my friends, but thinking something and experiencing it are two very different things. Cobain’s death made the consequences real. I could see and hear the impact that his selfish choice had on his wife, his friends, his bandmates, his fans. I could feel my own anger and disappointment that he chose to exit the field rather than continue to fight the battle. The media feared that Cobain’s death glamorized suicide. They could not have been more wrong. Of his millions of fans and the millions more Gen Xers who experienced his death as a cultural touchstone, who watched the memorial with Courtney crying and screaming and cursing him and read article after article about the ugliness of the crime scene and the senseless loss of what he did, I cannot have been the only one who resolved, consciously or subconsciously, never to cause that type of devastation. I can’t believe that my life is the only one he played a small part in saving. It took another seven years for me to get help battling my own neurochemical demons, years also filled with a persistent unknown stomach pain, filled with unnecessary spirals into darkness and gut wrenching despair, filled with obsessive thoughts and insane incriminations that not only impacted my quality of life but also the lives of those who loved me. At twenty-seven, the age at which Cobain took his own life, I was finally forced to acknowledge that I had to fix myself. Someone close to me gave me an ultimatum: get better or get lost. Turns out that was mostly a bluff, but it felt real enough to me that I walked into a doctor’s office and declared that I had a “serotonin reuptake problem.” He smiled and wrote a prescription for Paxil, handed it to me, said “This should do it!” and walked out. Yeah, that may have be grounds for malpractice, but it worked. And thirteen years later it is still working. The darkness has been kept at bay. No more spirals, no more stomach pain, no more need to recite Dorothy Parker. Sure, the slings and arrows of outrageous fortune are still there, but I suffer them well, and do so happily most days. And I’d be lying if I don’t admit to feeling a bit of survivor’s guilt. Not just for Cobain, but for classmates and friends of friends who fought the same battle but chose the easier way out, or whose self-medication went horribly awry. I feel guilty because I know that the triteness of “there but for the grace of God go I” belies an unfair truth. I know that grace, in the Augustinian sense, truly did play a huge role in determining my happy outcome. I had the luck to be born to wonderful parents and to find amazing and supportive friends. My suffering has never been objectively severe. It was never based on real tragedy. I was simply cursed with an odd neurochemistry that, thankfully, Big Pharma decided it could make loads of money by treating. Circumstance favored me in a way it did not favor others. I’m writing this because the least I can do is admit my own struggle and my good fortune and thank those who helped me get through unscathed (including Cobain). And I know many of you have struggled and continue to struggle with the darkness, so let this stand as an exhortation to keep up the fight and accept help when it is offered. I ask any of you who read this to remember this aspect of Cobain’s legacy when you think of him or his music, whether it is tomorrow or in another twenty years, and to honor it by looking out for similar suffering in others and doing your best to help when you see it. Join me tomorrow as I raise a glass to Cobain and the countless others who fought the battle against the void. By luck and circumstance as much as strength, some of us won that battle while others lost. I hope a Leonard Cohen afterworld awaits us all.